The right kitchen countertop is a true investment, adding endless beauty and value to your home. But with so many options in the market, which one should you choose? 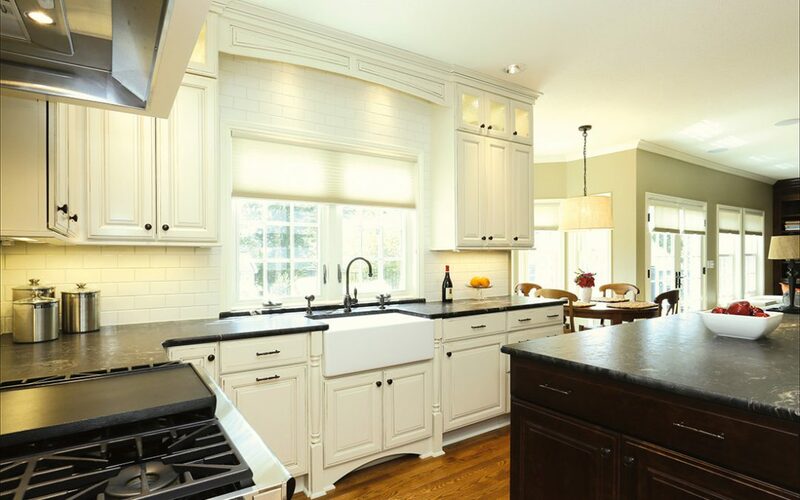 We’ll take you through the best kitchen countertop materials to suit your lifestyle and taste. There’s a reason granite is the holy grail of kitchen countertops. Besides its stunning beauty, granite boasts outstanding toughness and durability–the surface hardness of granite kitchen countertops is beaten only by diamond. That makes granite a great choice for large families and serious home chefs. However, some types of granite are highly porous and may need extra maintenance. Marble is another premium quality kitchen countertop material. It will quickly become a design centerpiece, each piece of marble displaying unique patterning and coloration. In action, marble countertops serve as a great non-stick surface for baking and food preparation. The coolness of marble also makes it a great cooking surface. Over time, this porous stone may absorb stains or cracks so it’s important to look after your investment. For a truly elegant look, choose natural soapstone’s matte green and grey. Soapstone will give your home a classic aesthetic along with fantastic day-to-day durability. Soapstone also resists stains and withstands damage from acids, chemicals, wine or hot kitchen implements. That’s why it’s a great overall choice for beauty and low maintenance. Silestone is another great choice for stunning beauty paired with low-maintenance appeal. Rather than the natural stone countertops discussed above, silestone is composed of engineered quartz, plastics and synthetics. But these man-made materials come with major advantages. Firstly, you’re able to choose from a greater array of colors than natural stone. Silestone is also incredibly hardy and light for easy installation. Laminates have come a long way in the past few decades. Now the most popular kitchen countertop material, acrylic polymers offer beautiful colors at a competitive price point. Best of all, plastic laminate countertops perform well under pressure, being highly durable, low maintenance, nonporous and heat safe. For a chic industrial look, concrete offers sleek lines and an elegant variety of colors. Its resistance to scratches, burns and heat makes it a highly attractive option for busy families. Concrete countertops will last well into the future, retaining its beauty and character with age. Stainless steel countertops are no longer for commercial kitchens. It has risen in popularity due to its clean, sleek design and practicality. Stainless steel is also great for those with a busy lifestyle, being heat retentive, non-stick and easy to clean. However, the drawbacks of stainless steel include being prone to fingerprints and cutting marks.